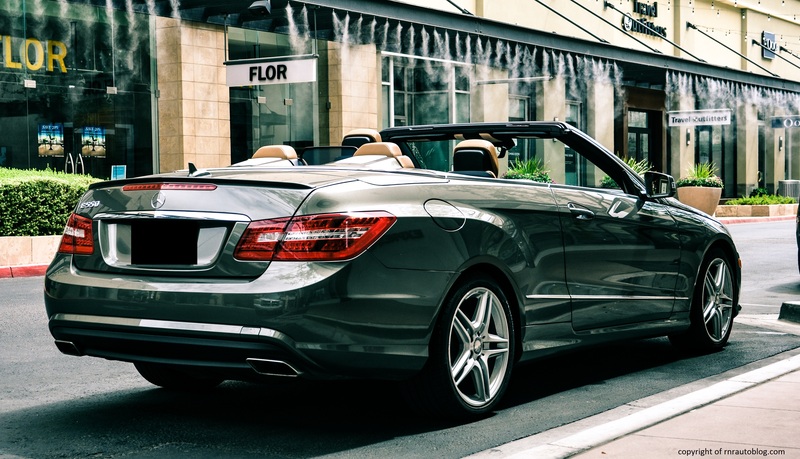 I don’t usually like the designs of the latest Mercedes-Benzes, but I have to admit, I find this E-Class convertible gorgeous. 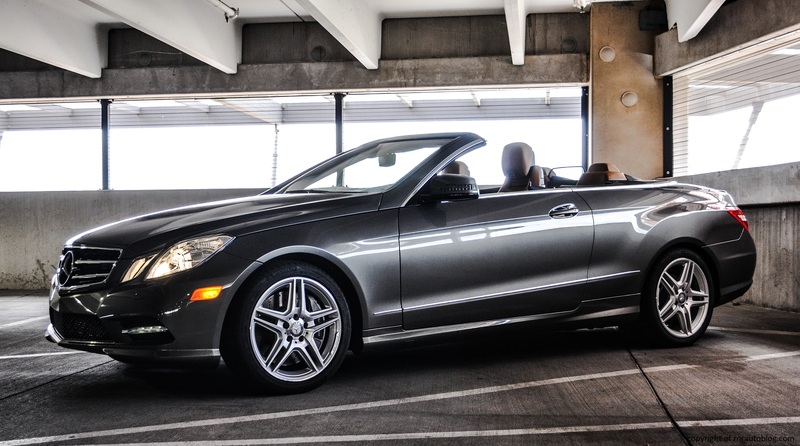 I prefer the front fascia of the pre-refresh E-Class convertible instead of the 2014. The reason being for this is due to the split headlights. The 2014 refresh eschews these headlights for two ordinary headlamps. 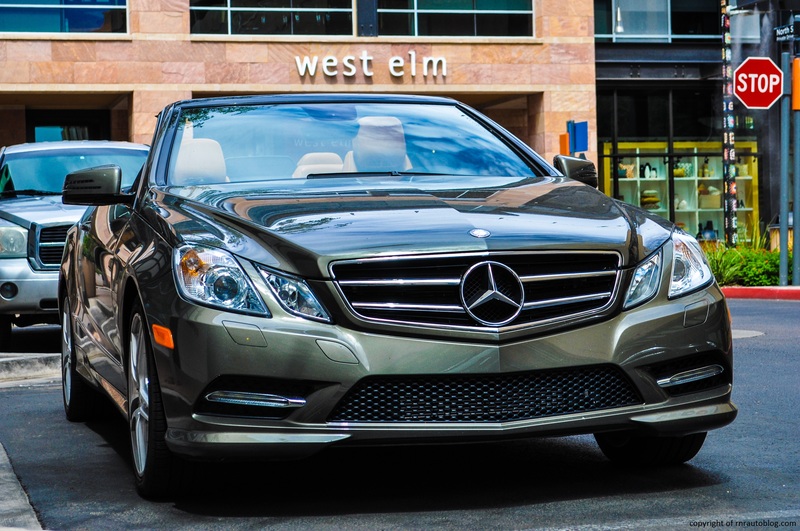 The split headlights give the E550 an unique identity that is not matched by any other cars on the road. I like how the lower bumper manages to be both elegant yet slightly sporty. The mesh embedded in the outlets give it a sporting appearance, while the LEDs lights are integrated nicely in the sides. 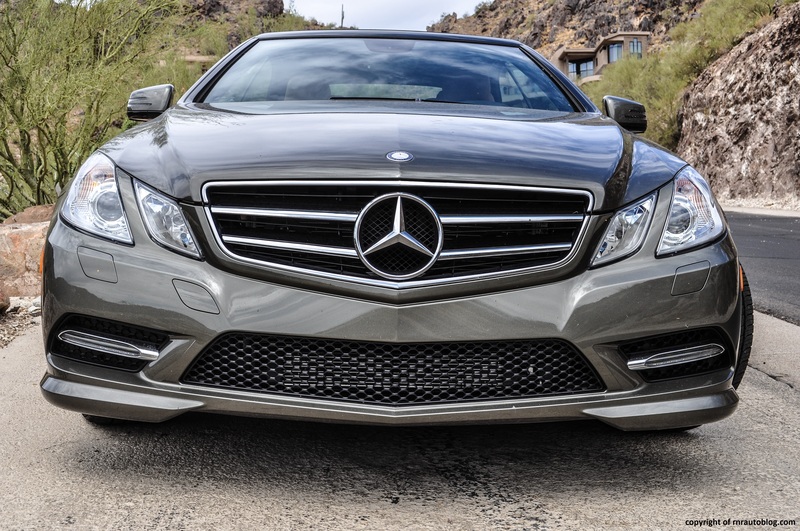 Another thing I hate about the latest Mercedes-Benzes is the logo on the front. They are now basically a plastic part and not see through. Thank goodness that this actually has a proper and see through logo in the grille. The classy theme continues into the side profile. The simple yet elegant side features a defining character line that starts from the front fender to the taillight. The bulging rear fenders is meant to be a throwback detail to the original 1953 “Ponton” E-class sedan. At the rear, the exquisite taillights grab your attention, and I like how they stretch to the trunk. Another detail that I also like is how there are lines that draw from the edge of the taillights creating the upper part of the rear bumper. The interior is stark in terms of colors, but this is offset by the orange leather seats. With the top up or down, it looks stunning. 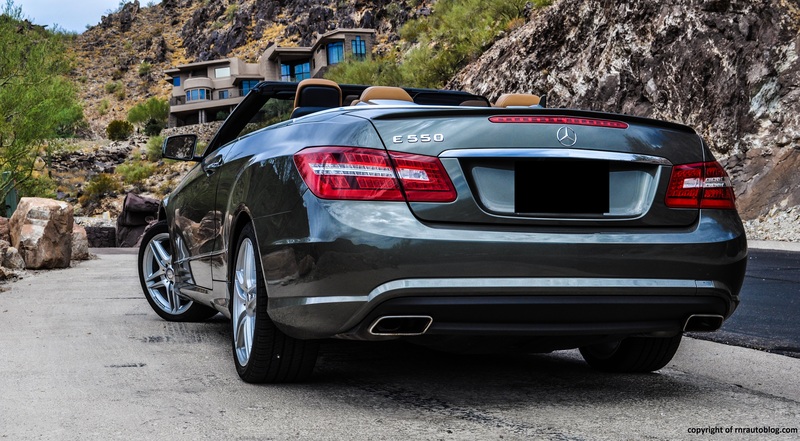 Even though this is the Sport trim, this E550 convertible can’t be described as sporty. The steering is light at low speeds, but it weights up inconsistently. There is no natural buildup in its weight, and there is a dead spot on center. The suspension is well suited for normal roads, but this being a convertible, its loss in structural rigidity is clearly felt when approaching road imperfections in corners. The body flexes, and there is a noticeable shake. 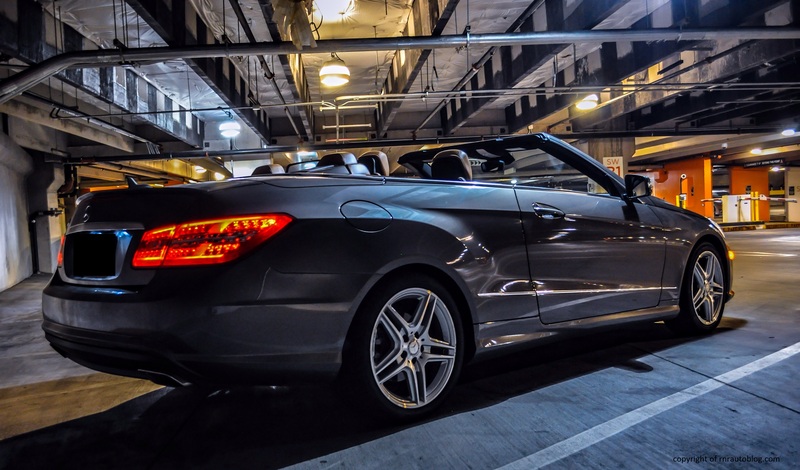 As a convertible, there are many times when its bulk is clearly felt, and the steering becomes slow and languid in overly enthusiastic driving. When pushed, it does tend to understeer quite a bit, but it remains stable. The steering, save for the weird weighting, is quick and accurate, although feedback could be better. The ride quality is compliant for the most part, but this being the Sport trim, which comes with a stiffer suspension setup than the Luxury trims, gets unsettled by harsh road surfaces. However, the highway ride is well controlled. 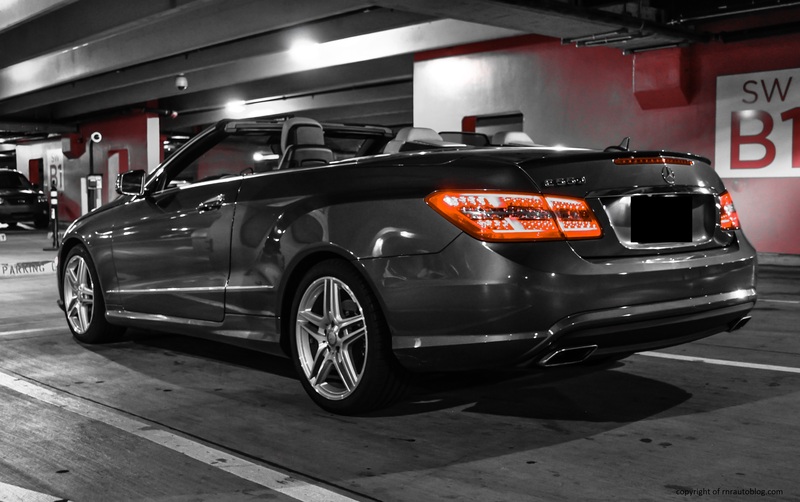 Prior to 2012, the E550 was powered by a 5.5 liter V8 engine making 382 horsepower and 390 lbs of torque. However, as an attempt to downsize, the 5.5 liter was replaced by a twin turbocharged 4.7 liter V8 engine. Despite the decrease in size, horsepower and torque were increased to 402 and 443. Having the opportunity to drive my friend’s 2008 E550 sedan with the 382 hp non turbocharged engine, I can say that this twin turbocharged V8 is better in every way. I usually prefer non turbo charged engines over turbocharged engines due to their linear power delivery and lack of turbo lag. However, this new V8 has virtually no turbo lag, and its punch kicks in at low revs. 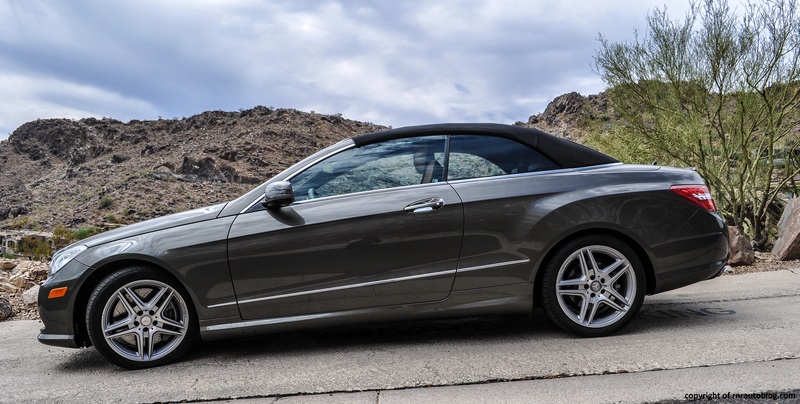 It is extremely responsive, and acceleration is effortless and never feels hampered by the convertible’s weight. This engine is so good that I am struggling to find the words to explain how good it is. The seven speed automatic transmission blunts its performance a bit as when you floor it, there is a delay, and then it shifts abruptly. With the top down, refinement isn’t too bad. Wind buffering is non existent, and you can still hear the glorious engine note. However, surprisingly for a Mercedes-Benz, there was some wind noise with the top up. If it was a Honda or a Toyota, then it would be fine, but it was unusual that a Mercedes-Benz costing this much had this much wind noise. However, the V8 is refined, and the engine note is just pure harmony. True to Mercedes-Benz fashion, the cabin is a nice place to be with exemplary fit and finish and fastidious attention to detail. The one thing I did not like about the cabin was the windshield. I am always aware of how close to my head the windshield was, and if I lowered my seat, then I had trouble seeing over the hood. This might be problematic for some people trying to find a decent driving position. The leather seats are supremely comfortable, offering the right amount of the softness but not so much that it feels like you sunk into a super soft sofa. There is adequate room in the front, but there were times when I felt it could have been more airy, especially with the top up. When it comes to the navigation system, there are better navigation systems out there. Mercedes-Benz’s COMMAND system is quick to respond, but it takes many steps to get to the desired function, and the climate controls are placed lower than I would like. The buttons on the steering wheel could be labeled better because they don’t clarify if the buttons are for the volume or changing the station. Fortunately I figured it out anyways, and the controls become easier as you get used to it. Access is moderate, as you have to duck to avoid hitting the windshield, but the doors open wide for easy access. Getting into the backseat is decent for a convertible, and there is sufficient room for two small adults in the back. Visibility with the roof up is not that great, but it will suffice. 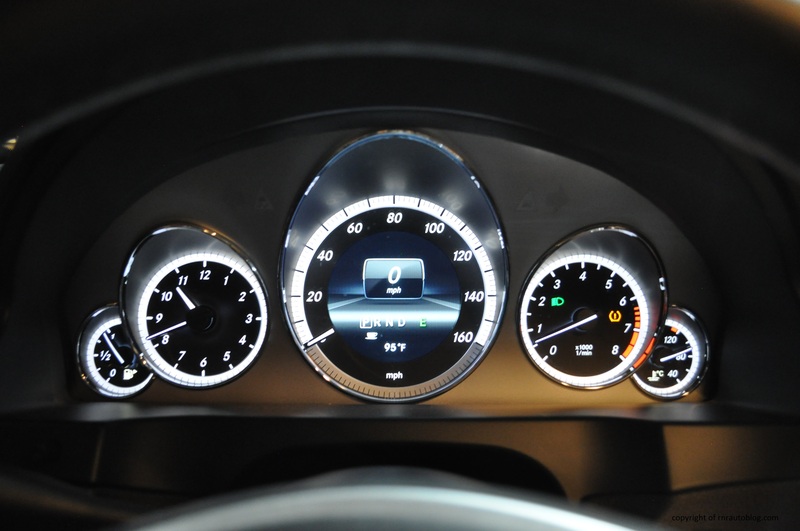 The gauges are simple enough, although it can be hard to read the gear selector in the speedometer. I love the white rings encircling the gauges assembly, and the chrome rings give it a classy touch. The trunk is a good size, even with the top down, and there is decent cabin storage. The convertible top’s operation is quick and easy, and the convertible switch is located in a covered pod besides the center console. They say to never judge a book by the cover, and this is true of cars. 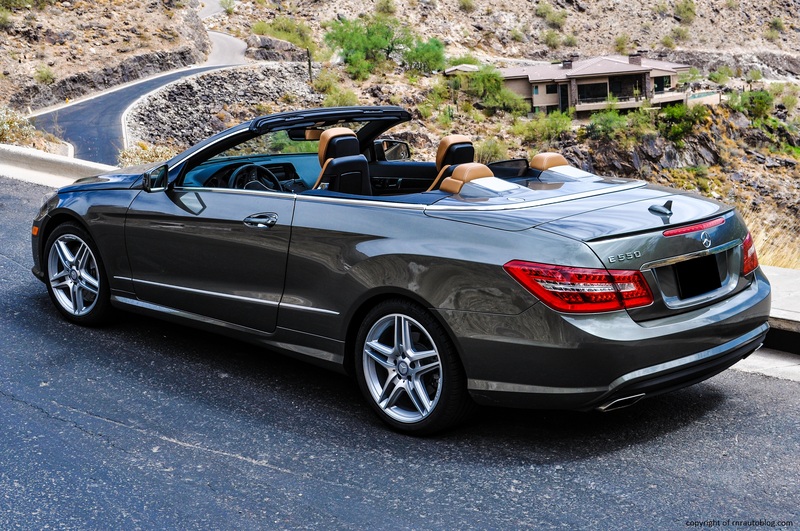 However, when the E-Class convertible came out, I was enticed by its gorgeous styling. To me, Mercedes-Benz are either elegant, appealing, handsome, or overly styled, but never have I thought of a Mercedes-Benz as gorgeous. The SLS AMG and the second generation CL-class are exceptions. But not only that, I actually prefer this over the coupe and the sedan. When it comes to convertibles, I am always quick to criticize them for being heavier and less fun to drive than their coupes counterpart. But in this, these flaws are outweighed by its competence. First of all, it is gorgeous, and I can’t stop thinking of how pretty this car is. Secondly, even though it lacks the dynamics of say, a Porsche 911, it is fun in its own way. 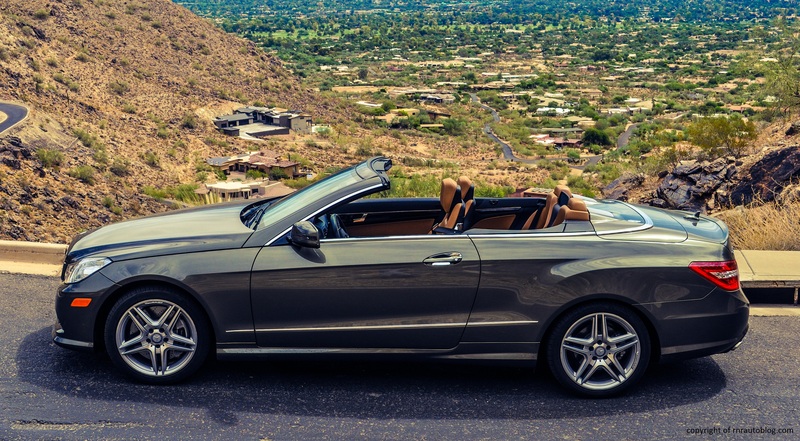 Picture this: Driving on a twisty road with the top down, and yelling “Whee!” at the top of your lungs only to be masked by the wonderful V8’s fantastic engine note. That is how much fun I had with this car. Yeah, sure, the controls are annoyingly confusing, and the windshield is perilously close to my forehead, and it rattles on poor roads, but it doesn’t matter. 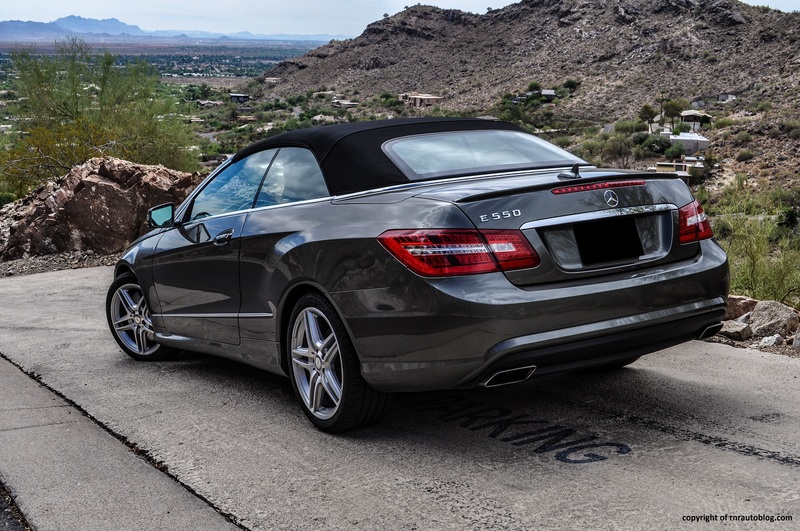 I’ve already fallen in love with this car, and this might be the only modern Mercedes-Benz that I would buy but only as a E550 and as a convertible. 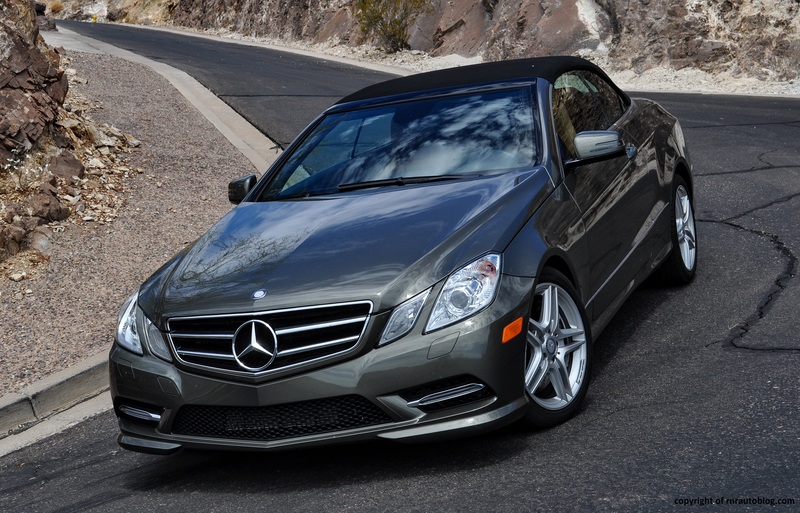 This conclusion does not apply to the 2014 E-Class convertible because the 2014 update took away the split headlights. I know I sound like one of those Mercedes-Benz fans (which I’m not) who can’t stop saying good things, but this E550 really took me by surprise. 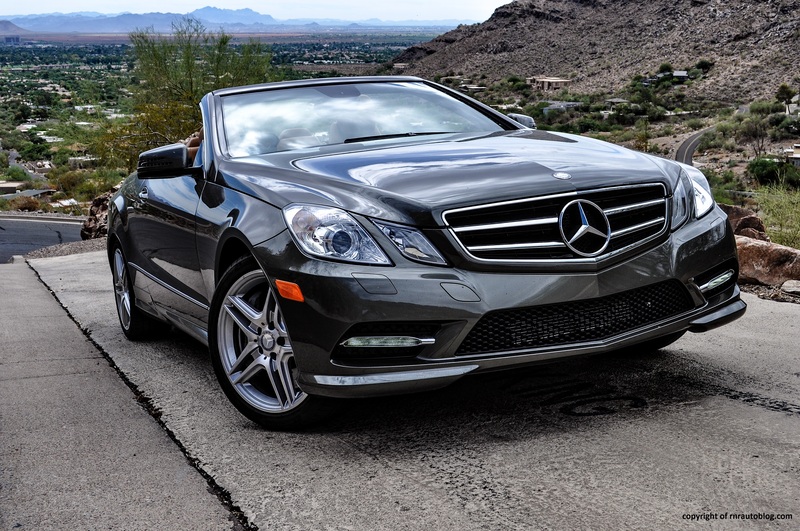 It made me do things that I never thought that I would do: love a modern Mercedes-Benz and prefer a convertible over the coupe or the sedan. It really is that good. I have 90k miles on a 2009 CLK350 convertible. 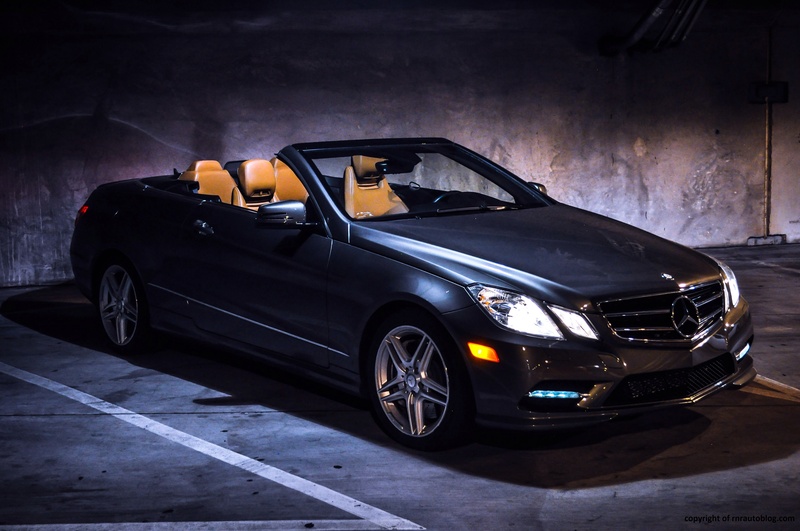 Recently(20150213) discovered a new 2013 E550 convertible at a local dealer. Thought I would give it a try. However, I was severely disappointed in virtually every regard- Noise level higher and drive harsher(probably due to the 18″ Michelins). The view out the front window was horrible due to the high hood line and the sweeping windshield. I am 6′, and with the top up I felt my head was too close to the windshield header. The top of the doors are higher, keeping me from straggling my arm on the door. I felt like I was slouching in the car The drive with the top down in the E550 is much more subdued then my CLK350 which can be harsh. 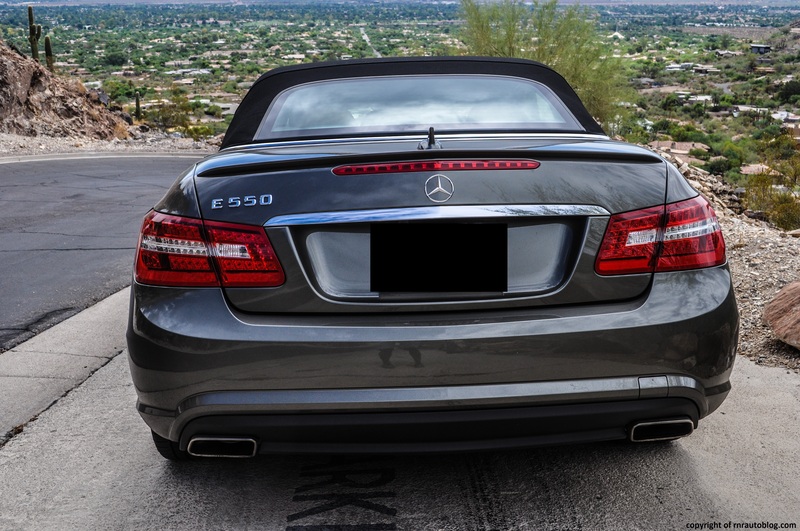 I think the CLK350 is more attractive with the top down with it’s lacquer like polished and humped rear valence compared to the speakers shown mounted behind the rear headrest of the E550. The seats were stiffer, but with all the seat adjustments, the seating was fine. Regarding the performance, and we put our demo through a good 15 miles. And, after the drive, I understood why this car was still in the lot. 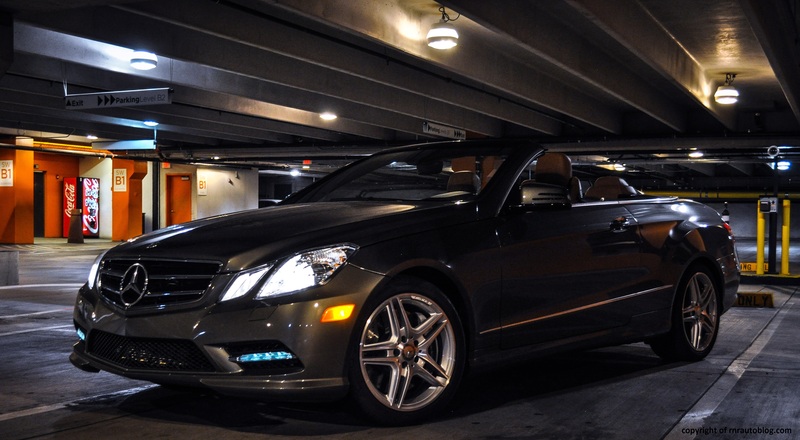 First, the E550 did “make” unbelievable power. Straight off the line, or on the freeway, this was an amazing car to put the pedal to the metal. However, in stop and go traffic or streetlight to streetlight traffic, there were many instances when the car didn’t seem to know what to do. If you are going 15-40 and you give the car a heavy push to the gas(not quite to the floor), there was a significant hesitation. And, when you decided to change your mind during this hesitation, the acceleration would briefly kick in. I don’t know if it was the engine management or transmission management. But it was repeatable, it was consistent, and it was just plain awful. Maybe this is why the car was sitting in the lot for 2+ years. 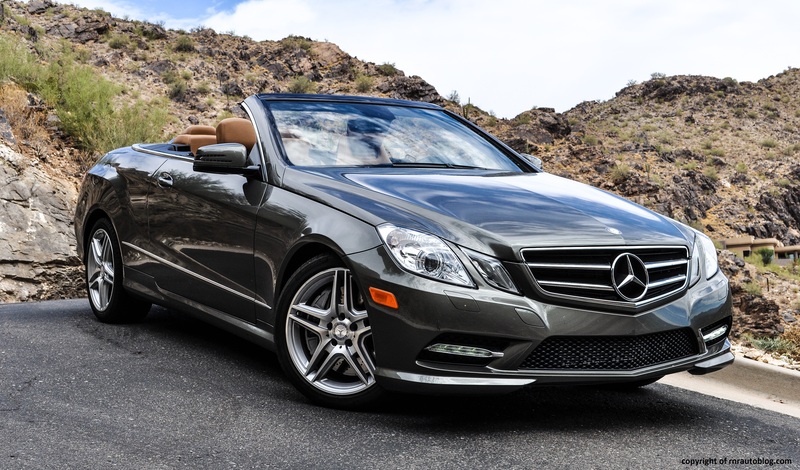 (We did drive a second 2013 E550 convertible from the same dealer that evening. Same issues) I might mention the gas pedal also had a funny feel to it. In summary, this was not a buy. 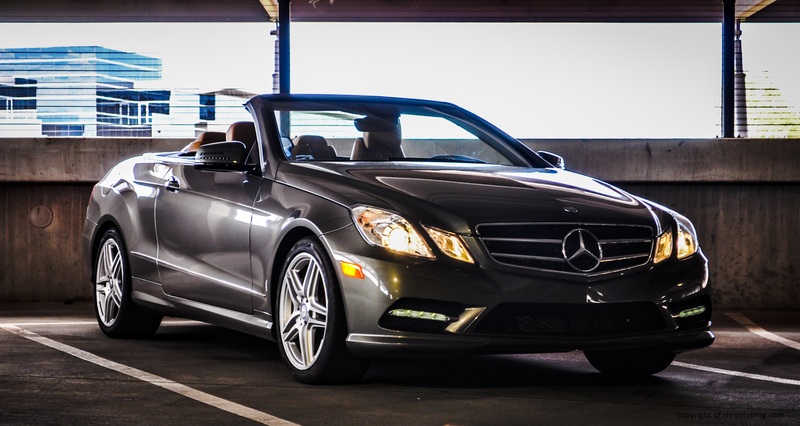 We’d rather have our CLK350 and a basket of cash then the E550. 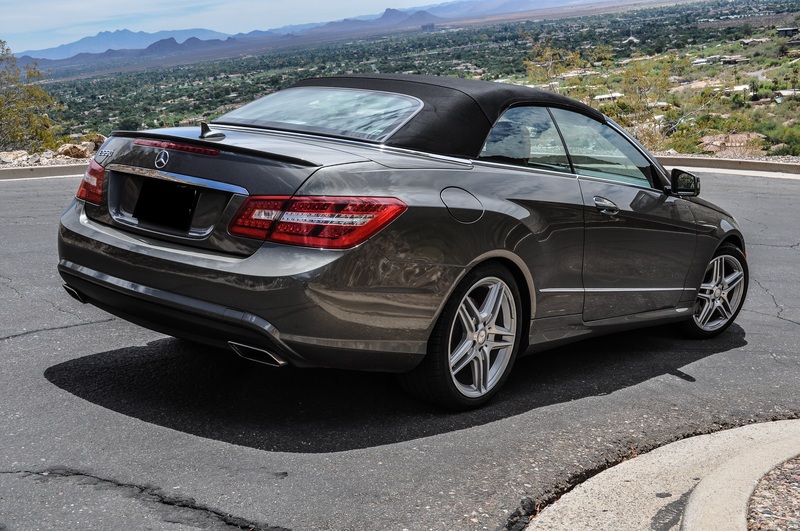 Very sorry to hear that you did not enjoy the E550 Convertible! The CLK350 is a nice car. I agree with you about the transmission and headroom issues.